You may wonder why you have not heard much about Arctic sea ice death spirals and Greenland heatwaves this winter. Hardly surprising, because the Arctic stubbornly refuses to follow the agenda. Average sea ice extent last month was the highest since 2013, and stands as high as it did in 2005. 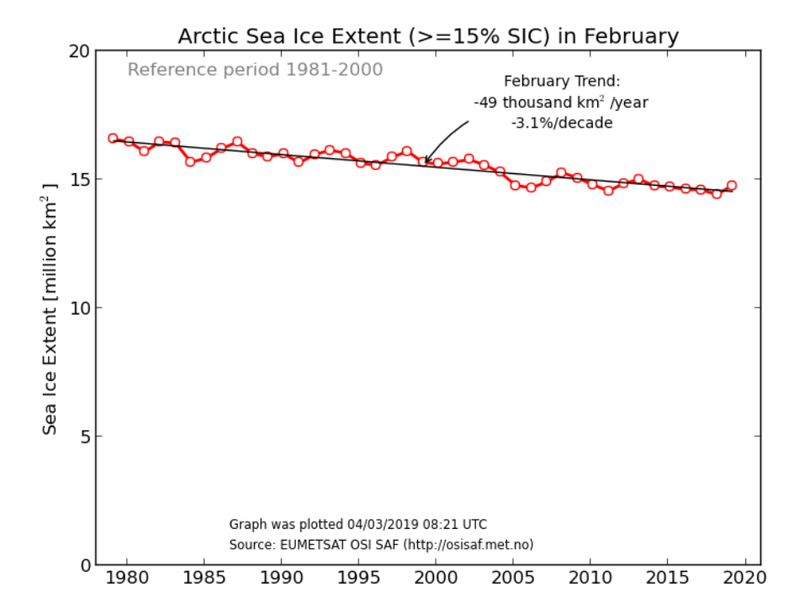 In the Arctic sea ice extent debate both alarmists and skeptics have assumed that year to year changes in summer minimum and winter maximum sea ice extent are explained in terms of AGW but neither side has ever presented any evidence to support that assumption. This statement in incorrect. There have been two phases of warming globally since. Within the Arctic there have been similar episodes, but of much greater magnitude. In the Arctic there was significant cooling in the two phases. Here is my temperature reconstruction from HADCRUT4. There is good evidence that during the cooling phase Arctic sea ice years. Try looking for “HH Lamb Sea Ice Years” on this blog. The rise in CO2 levels (i.e. 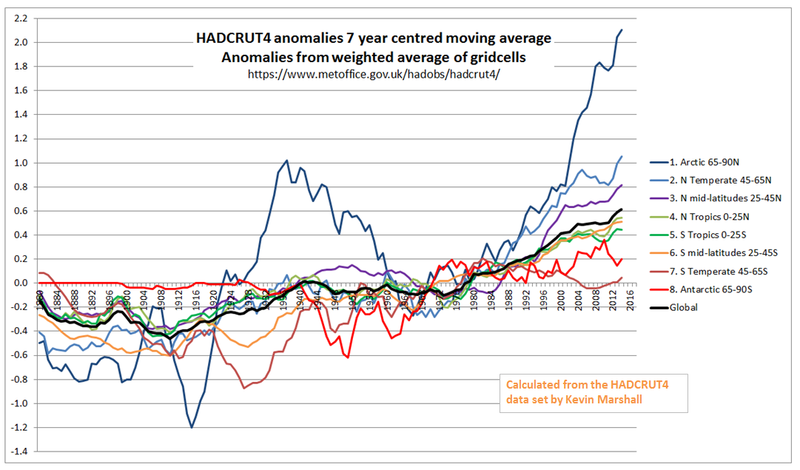 AGW) cannot explain either the 1910-1940 warming or the 1940-1960 cooling. It is not full known what causes the movements in sea ice. In the Arctic sea ice extent debate both alarmists and skeptics have assumed that it matters. For Man, LESS ice is better. Yet skeptics think it important trumpet more ice when it occurs. All part of the strange world of climate science. Perhaps the Antarctic fails to understand the agenda too, as testified by last month’s loss of the remote submarine, searching the location of Ernest Shackleton’s ‘Endurance’ under the ice and then the hasty retreat of its mother ship to escape pack ice. One might have expected ‘Endurance’ to be under clear blue water after more than a century. Paul, check DMI sea ice volume 31Aug03 against 31Aug18 (height of summer ice melt). You will find there is little change in 15 years. Funny how it’s supposed to have been ‘rapidly melting’ since 1979 or so, but is still there in considerable volume. We await a new definition of rapid. This year, the ice extent where the Gulf Stream ends has been expanding to ‘normal’ dimensions as predicted a couple of years ago by Norwegian experts. The extent, in the Pacific outside of the Bering Strait, was restricted by Westerlies bringing quite warm air over that region.